Be Very Quiet I’m Hunting … Strawberries? I love hunts that give a touch of challenge, but ultimately let the hunter live victorious. Cozy Spring’s Guest List Cart Sale and Free Hunt is exactly that kind of feel good, leave happy experience. This event runs through April 21st, so you’ll have to hurry over to get in on the goodies. Here’s a nice closeup of the C & F’s hunt gift along with another of the fun group gift hairstyles available at EMO-tions. The group is free to join, and offers several past gifts. Palladium, pink diamonds, and a resize menu – need I say more? Thanks Beloved Jewelry, a girl can never have enough bling! If you’re a classic pump lover, then the I.M. Collection’s Jackie-O hunt gift is bound to please. 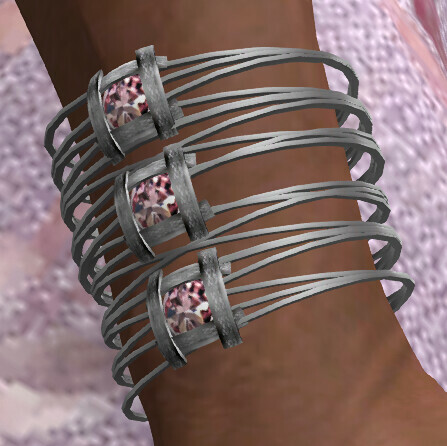 They come in 6 colors, sized to fit Maitreya, Slink, and Belleza mesh feet. Since there are so many other Easter goodies waiting to be unearthed I’m going to cut today’s commentary short.